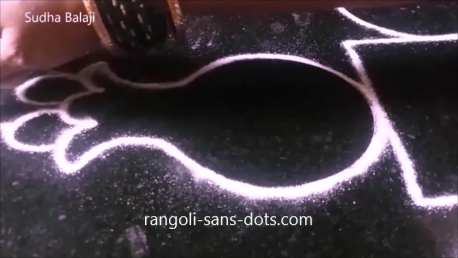 The images below show the steps in making this rangoli. 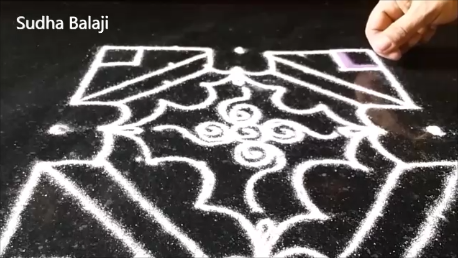 The picture below shows the completed rangoli after all the decorations. 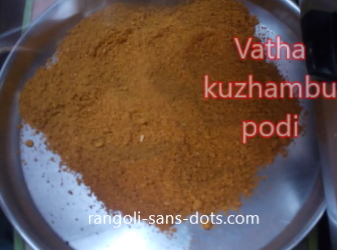 Now that we have got the basic shape of the pot right, draw patterns as shown in the next pic to represent sweet Pongal overflowing from the rim. 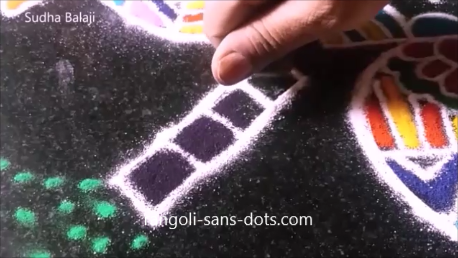 Decorate the pot with free hand patterns according to your imagination. Next inside the square patterns and designs are drawn. 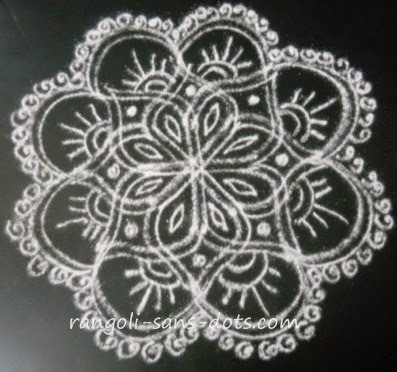 The Sun occupies the centre of the rangoli just as it occupies the prime position in our daily life ! The next step is to add colours inside. 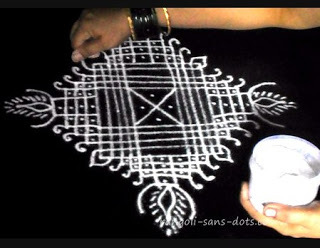 Since the patterns are intricate add the colours carefully without overlap or smudging. Place a pair of ice cream sticks on all four sides between two pots. 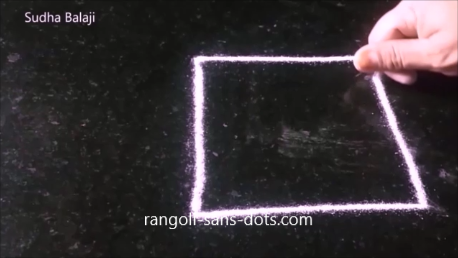 Draw straight lines on either side of the sticks to form the basic sugar cane design. Fill with different shades of purple . 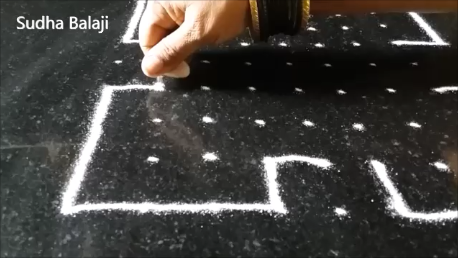 Green dots represent the leaves of the sugar cane. 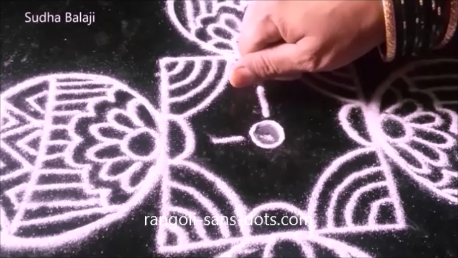 Drawing the Pongal panai images for festival decoration is the difficult of these type of kolangal. 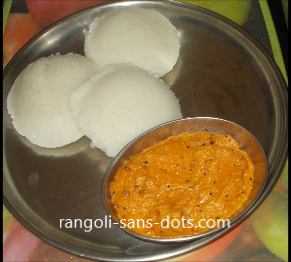 This theme is ubiquitous during Pongal festival. 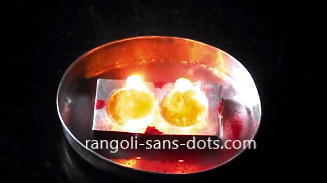 The Pongal pot, sugarcane and sun represent the day after Bhogi i.e Pongal or Makara Sankranthi. 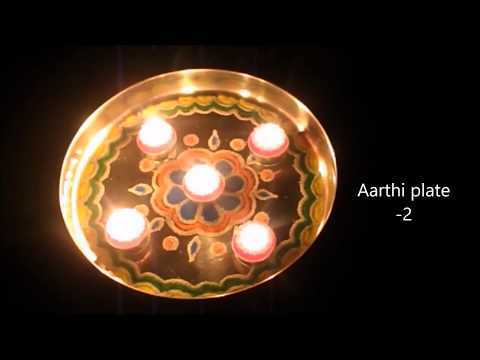 The Sun travels to Uttarayana which heralds the advent of the spring season. Sugarcane is harvested during this season. 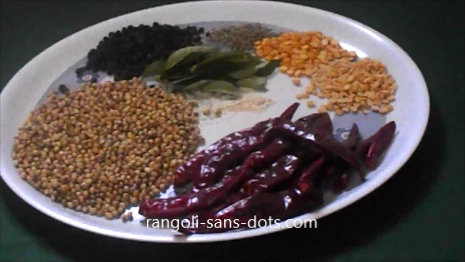 And sweet Pongal is prepared in a new pot decorated with designs. 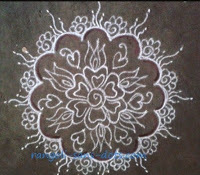 Four or even five rangoli designs may adorn the entrance of the house. There is also a tradition of wearing new clothes. 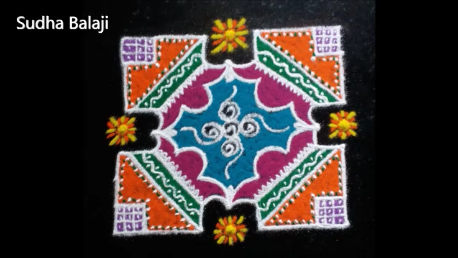 This festival is similar to Diwali in the joy, celebrations involved except crackers. 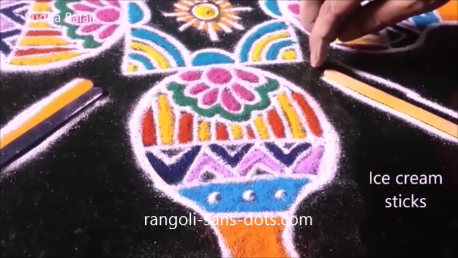 I have shared lots of Sankranti pot rangoli with dots in Rangolisansdots. There were requests for making drawing of the Pot design easy because drawing near perfect curved lines requires a lot of practice. 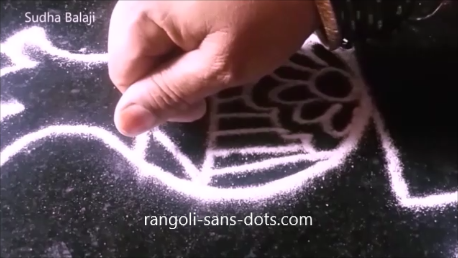 The interest is rangoli is increasing and there are many who want to learn and try this art daily and for various festivals. I understand that there is an increasing interest among kids too. 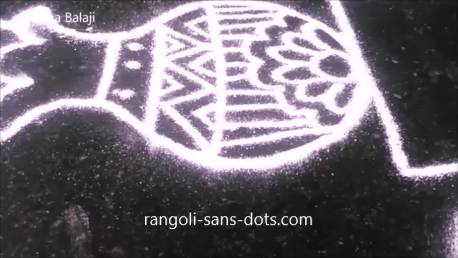 So I hope that this simple Sankranti pot rangoli idea will be useful for festival decoration and for competitions as well. 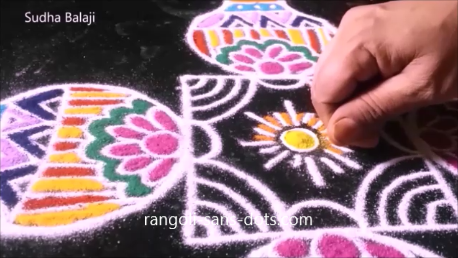 A traditional pot design with 9 by square dot rangoli that can be part of our Sankranti rangavalli decoration is shown below. 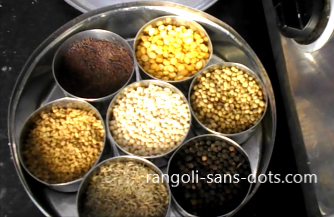 With this grid we get four Pongal pots decorated using the dots that remain.